Quilted on my HandiQuilter Sweet 16, this quilt is massive – King size with overhang. 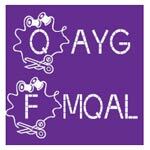 LOADS of detailed free-motion quilting. And very appealing to cavaliers apparently. It’s an original design (obviously, being an improv Bee quilt) and I think it is my favourite piece ever…. It’s one I’d really love to show off and enter in a show were we to have a Modern Quilt Show in my state. But I won’t hold my breath for that so I am so pleased to be able to share it with you as part of the Blogger’s Quilt Festival! What a beautiful submission for the festival! That must be a huge quilt with that much overhang on a king size bed; very impressive! Absolutely beautiful. It is stunning and should be in a quilt show. And the “props” are wonderfully photogenic. Your quilt is fabulous. Love the design. The quilting really makes it! Such fun! Beautiful! That is gorgeous – and huge!!! This looks fantastic-both design, colours and the quilting. I absolutely love this. What a great idea! It’s so striking and memorable. Thanks so much for sharing! oh wow, this is an amazing quilt! I love a bit of Mondrian so this is right up my street. I love they way it fits your bed perfectly then has that cool overhang with the coloured squares! OMG I absolutely LOVE this piece. I love Mondrian and I love this take on it. Super job. Definitely a favorite of mine. Lovely quilt! I especially like the borders on this one! This reminds me of some of Frank Lloyd Wright’s art as well, but wow, you nailed it on the Mondrian. Love the quilting you did too. And your fur kid has great taste, lol! Oh that first picture!!! Amazing quilting and I love the added border, it’s massive! !